Wed., May 16, 2012, 4:28 p.m.
BOISE - Tax-protesting Idaho state Rep. Phil Hart’s legislative career will end this year, Idaho voters decided on Tuesday. Hart was defeated in a four-way GOP primary, edged out by Ed Morse, a longtime real estate appraiser from Hayden. Now Morse will face former longtime Kootenai County Clerk Dan English in November. Despite high-dollar attempts by interest groups and even other lawmakers to target various legislative incumbents around the state for defeat, Hart and eastern Idaho Rep. Jim Marriott, R-Blackfoot, were the only legislative incumbents defeated by challengers in the primary. Both incumbent Kootenai County commissioners also held their seats. Meanwhile, Idaho’s new closed primary drew record low turnout of just 23 percent of registered voters. The former longtime Kootenai County clerk, English for many years was the only Democratic elected official in Kootenai County. He’s now running in a legislative district that hasn’t elected a Democrat since 1994, and until this year, hasn’t even had one run since 2002. Morse said throughout his campaign, he heard concerns from voters in the heavily GOP district that includes Hayden, Hayden Lake, and the Rathdrum Prairie. “Voters are concerned about the size and cost of government, concerned about dissension and lack of cooperation amongst political parties and politicians, and there was an awful lot of frustration with Mr. Hart in the voters that I talked to,” he said. 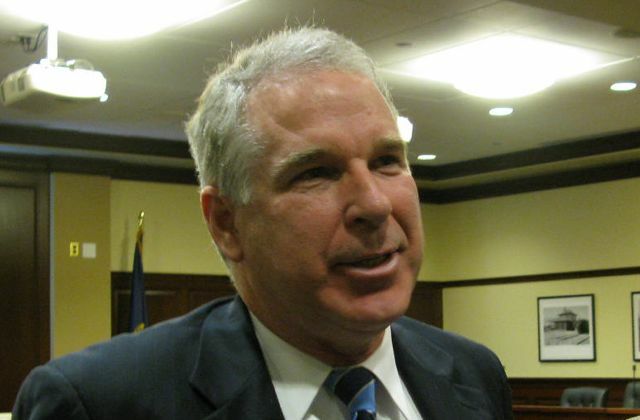 In the past two years, news emerged that Hart is locked in an ongoing court fight over back state and federal income taxes, a fight that’s included a failed appeal to the Idaho Supreme Court and a pending federal lawsuit in which the U.S. Justice Department is seeking to foreclose on his Athol home for $550,000 in back federal income taxes, penalties and interest. At least half a dozen times during his four terms in the Legislature, Hart, who claims both state and federal income taxes are unconstitutional, has cited legislative privilege to seek delays in his tax fights or defend his actions. Last month, a federal judge rejected the defense, and ordered Hart to stand trial on Nov. 6 - well before the start of next year’s legislative session, to avoid any other objections relating to conflicts with legislative service. That happens to be the date of the general election, but now Hart won’t be on the ballot. He’s also continued to defend his 1996 illegal harvest of trees from state school endowment land, which he used to complete construction of the same log home on which the feds are now trying to foreclose. Hart lost multiple court appeals over the timber theft, and never fully paid an outstanding judgment. He maintained he had a right as a citizen to take the logs for free. Hart, who didn’t return a reporter’s calls Wednesday, faced multiple ethics complaints in the House over both issues, and lost his seat on the House tax committee and his vice-chairmanship of the House Transportation Committee; he apologized to the House in 2011. In the Legislature this year, he unsuccessfully pushed legislation to declare gold and silver coins to be legal tender and to exempt direct sales of farm produce from all regulation. Published: May 16, 2012, 4:28 p.m.